White Teeth Not Sure Healthy - Having white teeth shone as he often looked in the toothpaste ad be many people's dream, but also dark teeth can be tolerated because the important thing is cleanliness, no tartar or holes. Brushing teeth is dental problem number one defense. At least we have to brush your teeth after breakfast and before sleeping at night. Brushing teeth if done right can get rid of bacteria and plaque were most responsible for all dental problems. However, according to the Indonesian Health Research in 2007, only 7 percent of the population that behave properly brush your teeth. It was also found that dental nursing numbers are very low, the delayed onset of dental care and tooth decay are largely ended with the revocation. How to brush teeth properly, like brushing your teeth too hard or scrub with a brush that was in bloom, according to drg.Zaura Anggraini no use. "Bristles are already in bloom it is also not effective in cleaning the teeth so many food debris and bacteria left behind," said the doctor who diakrab Rini called it. Correct brushing is holding the handle of the brush in the palm of the hand while the thumb aligned to act as a barrier. How to hold the brush like an angle such that the feathers reach the lower gums and gums in addition to the tooth surface. Slowly, rub with a toothbrush back and forth movement of the short-short, three tooth brush just once. Then with a slight ankle twist, brush to brush the side of the tooth to remove dirt and bacteria from the gum line. Doctors Rini added, the children need to be taught how to brush their teeth. "Children usually just rub the front teeth, even though that is easily perforated rear gear section," said the chairman of the Executive Board of the Indonesian Dentists Association. 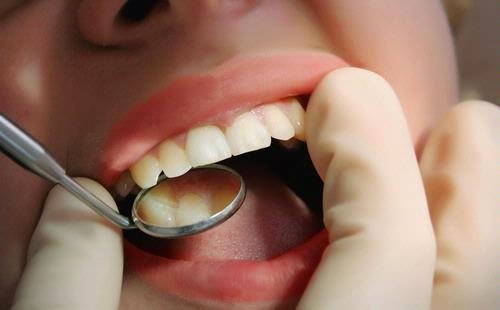 Teeth cleaning process is not complete until the entire surface of the tooth will cause plaque or colony of bacteria that cling tightly to the surface of the teeth and gums. The plaque will not be lost simply by gargling mouthwash wear and must be cleaned by brushing. "Germs that secrete acids that cause tooth decay," he said on the sidelines of the National Dental Health Month pancanangan in Bandung, West Java, on Monday (12/9/11). If the plaque is formed, over time will become tartar, and we have to clean it up at the dentist. "Brushing your teeth are not working to tackle tartar, so better be prevented by correct brushing," he added.